Moscow is bolstering Syria’s air defence a week after it blamed Israel for the accidental shooting down of its aircraft, killing 15 servicemen on board. On September 17, a Russian Il-20 plane was hit by a Syrian S-200 air defence missile when it was landing following attacks by Israeli F-16 planes on western Syria. Moscow blamed the friendly fire incident on Israeli pilots using the larger Russian plane as “cover”. In a televised statement on Monday, Defence Minister Sergei Shoigu said the decision to “transfer the modern S-300 air defence system to the Syrian armed forces within two weeks” was taken by President Vladimir Putin and is one of the “response measures”. “According to information of our military experts, the reason (behind the downing) were premeditated actions by Israeli pilots which certainly cannot but harm our relations,” Kremlin spokesman Dmitry Peskov told journalists. However, the Kremlin said the installation of S-300 was aimed at increasing safety of Russian military and “not directed at any third country”. The Russian military said the Il-20 electronic intelligence plane was hit 35km off Syria’s Mediterranean coast as it returned to its home base nearby. Russian defence officials described manoeuvres by Israeli fighter jets during the incident as “hostile” and said it had a right to retaliate. The Israeli military, however, said that Syria’s indiscriminate air defence fire was the cause of the plane crash. For several years, Israel and Russia have maintained a special hotline to prevent their air forces from clashing in the skies over Syria. Israeli military officials have previously praised its effectiveness. A dispute between Israel and Russia could restrict Israel’s ability to mount air raids inside Syria on what it considers the greatest threat to its security from the Syria conflict: the build-up of Iranian forces or Iranian-backed Hezbollah fighters. Given Russia’s strategic brilliance, the announcement probably indicates S-300s are already operational there and “data fusioned” to Russian systems in the greater Middle East area. They say they’re moving them there within the next 2 weeks. Discussion on Aljaz suggested this allows time for discussion with Israel. The problem for the Russians is that all Syria has is the S-200s at the moment, an inferior system and prone to misidentification of targets. 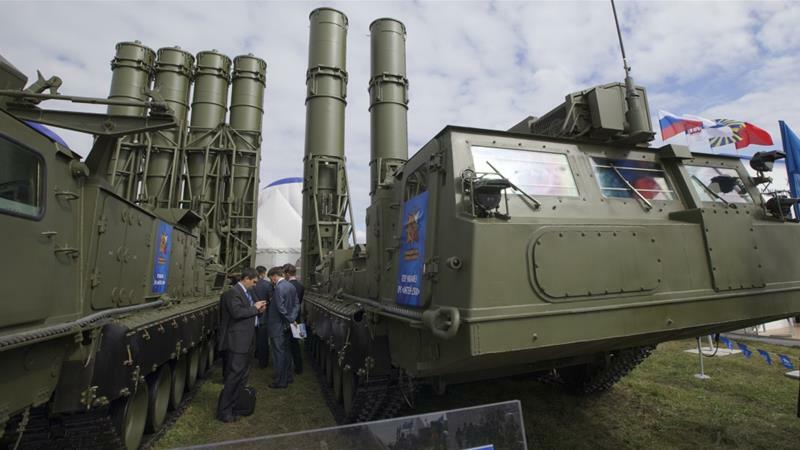 The news item also noted that several countries – including the US, so probably Israel too – have apparently claimed they can defeat the S-300 system. Of equal interest is the Russian Defence Ministry announcement they are going to start jamming military air communications in the Mediterranean off Syria. Putin is employing a masterful strategy in Syria, from my own reading of the situation. From the outset their strategy appears to have been to tell Assad they will back him to retake the whole country if he does what they say, and he’s doing whatever they tell him too. The US has been told to keep out of it – and apart from two very targeted missile strikes – they have. The Russian military on the ground maintain active communications with the US forces in the region to ensure no incidents; also with Israel. They don’t mind Israel doing a little bit of aerial chipping away at Iranian and Hezbollah positions near the Israeli border; their strategy seems to be to try and control Iranian influence in Syria as well. But they exploit incidents like this in the diplomatic arena. They need to keep an eye on Turkey which is threatening to intervene in Turkmen-predominant areas – but Turkey’s already had a hard lesson not to push the Russians, after shooting down a Russian bomber and being eventually forced to formally apologise & do a bit of bowing and scraping to Moscow afterwards. And Turkey can’t count on US assistance if Russia gets heavy with them. So, mostly rhetoric from Erdogan I suspect. Putin walks very carefully; always ready to take a step back & re-evaluate their tactics if they look likely to generate a major conflict with the US. Their diplomacy in Syria is the only diplomacy that has restored stability to areas that actually have been taken over by Islamic Fundamentalist groups – including ISIS, something the US plays down. AJ tv is reporting multiple sources claiming that Rod Rosenstein has been summoned to the White House where he is expecting to be told he must resign – over revelations that he once suggested the POTUS should be recorded during meetings – and that he has stated he will not resign – that Trump will have to fire him. Other sources are reporting he has actually resigned. The situation may be clearer later this morning nz time. Rod Rosenstein has not resigned and is still serving as U.S. deputy attorney general, a person familiar with the matter told Reuters on Monday. The person confirmed that the topic of resigning did come up in discussions with White House Chief of Staff John Kelly over the weekend, but said the Axios report that Rosenstein had officially resigned was incorrect. President Trump will meet with Rod Rosenstein on Thursday, the White House said Monday, leaving the deputy attorney general’s future in limbo amid reports of his possible ouster. The White House issued the statement after hours of confusion about Rosenstein’s job status triggered by a visit to the executive mansion, where the No. 2 Justice Department official reportedly expected to be fired or would resign. “At the request of Deputy Attorney General Rod Rosenstein, he and President Trump had an extended conversation to discuss the recent news stories,” White House press secretary Sarah Huckabee Sanders said Monday in a statement. What the hell is the point of having a 25th Amendment if a incompetent president or one of his faithful handmaidens can fire you for even suggesting employing it. This is the least legitimate reason in the world for firing a senior government official – “he wasn’t loyal. he wasn’t a team member. he raised the issue of actually using the 25 amendment”. trump would be very smart not to fire rosenstein over this issue lest it bring it to the fore all the legitimate reasons to consider trump intellectually impaired. Relax, Joe. Your Deep State is busy frying itself in internal warfare. Sit back and enjoy. Trump is.